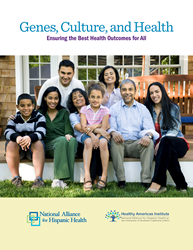 Today, the National Alliance for Hispanic Health, in collaboration with the U.S. Food and Drug Administration, released the report Genes, Culture, and Health: Ensuring the Best Health Outcomes for All. The report reviewed available research and found that while dramatic advances are being made in genetics and their clinical applications, the promise of personalized medicine is not being realized by all. “A lack of inclusion in genetic research is creating a genomic divide putting the frontiers of science and medicine at risk. Without a dramatic reversal in the quality of genetic studies, the benefits of personalized medicine will not be realized by all,” said Dr. Jane L. Delgado, President and CEO of the Alliance. Attention to issues of inclusion and access will advance personalized medicine by driving genetic discovery that benefits all. Advances in personalized medicine, from determining the most effective medicine and dose to new biologic therapies tailored to the individual, require inclusion of diverse populations in research. Major racial and ethnic U.S. populations, as well as women, are underrepresented in genetic studies. As of 2011, only 4% of genome wide association studies included persons of non-European descent. Without diversity in study populations, genetic variants important to disease and therapy responses may go undiscovered. Variants found in less than 5% of people may be the most significant to understanding disease risk and response to particular therapies. Downloadable copies of the Genes, Culture, and Health report and key findings are available online at the Alliance website (http://www.hispanichealth.org) and consumers can get information on how to have a discussion with their health provider on the role of genetics in their and their family’s health by calling the Alliance’s bilingual Su Familia Helpline at 1-866-783-2645. The National Alliance for Hispanic Health is the nation's foremost science-based source of information and trusted non-partisan advocate for the best health outcomes for all. The Alliance represents thousands of Hispanic health providers across the nation providing services to more than 15 million each year. For more information, visit http://www.hispanichealth.org, call the Alliance’s Su Familia Helpline at 1-866-783-2645, or find us on Facebook at healthyamericas or on Twitter at health4americas.